H 32" W 43" D 12 5/8"
This entry table was designed for clients who wanted a small table with a storage area accessed via a drop down door. 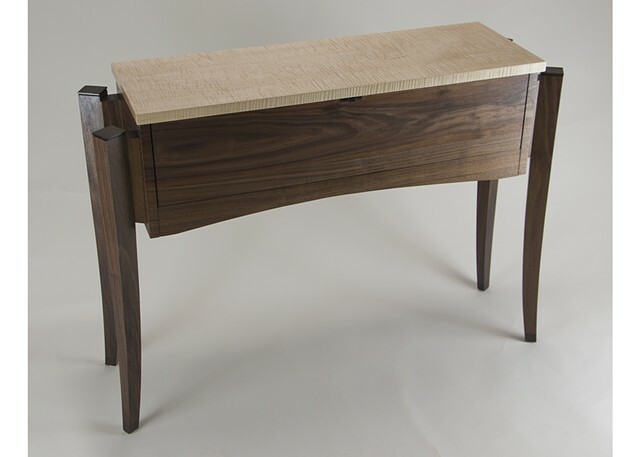 The top was made with beautiful curly maple and the base with walnut. Soss hinges were used to eliminate visible hardware from view. The door is opened using a push-release catch.The wood grain in the storage box is continuous from the sides to the front. Gently curved legs are angled to create visual interest when viewed from the side as well as the front. The legs have a wenge cap and foot.